Saturday March 21st, 7:00 p.m.
“BRD recently received incredible community support for a new choreographic project with Seattle modern dance great, Mary Sheldon Scott. 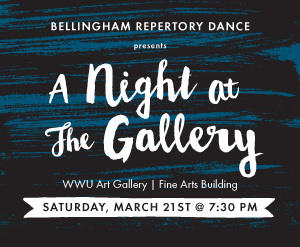 Join the dancers of Bellingham Repertory Dance and choreographer Scott on Saturday, March 21st for a unique performance in the Western Gallery. A Night at the Gallery will include excerpts of the work in progress, repertory from past seasons, poetry readings from the Chuckanut Writers Group inspired by the dance, a reception, and a window into the choreographic progress. The choreographer and dancers will discuss their works with audience members throughout and following the performance. have been accepted for the wall display in this program.